Millions of sun-hungry retirees make the trek down South each year to escape the cold and snow of winter. These folks are called “snowbirds,” defined simply as someone who spends the winter months in a warm place. “When it starts to get cold and the leaves fall, we are ready to head down South,” says Paul Fisher of Poestenkill, N.Y. The storage industry is very familiar with snowbirds and vise versa. Retirees who have two residences often use storage units near their “winter home” to keep things clean and safe while they’re away. We caught up with three retired couples who have been making the commute to the South for nearly a decade or longer. They fit the mold of “typical” snowbirds, but each has a very different (and interesting) life story to tell. Paul Fisher is easy to like. He is a man’s man who has looked death in the eye and didn’t blink. He’s had more than his fair share of physical setbacks but doesn’t complain. He is uncomplicated and humble. Moreover, he’s a hard worker who loves his wife and his 1965 Pontiac GTO. Paul grew up outside of Albany, N.Y. and was drafted in the Army right out of high school in 1968. At 18 years old, he was sent to Fort Dix, N.J., for basic training. When asked if he wanted to go to Army Airborne School, the teen was eager to reply. “Of course, I said yes,” Paul remembers. Off he went to Fort Benning, Ga. Paul became an Army Ranger and went to Fort Polk, La. before quickly heading to Vietnam. Paul was a Sergeant E5 in the U.S. Army, and like many Vietnam veterans, had some harrowing war experiences. Two days changed his life dramatically. “As an army ranger, they train you to get the enemy. Kill all of them and get the hell out of there,” Paul recalls matter-of-factly. Paul was “out in the field” in Bong Song, Vietnam on Nov. 14, 1969, when he came face-to-face with the enemy. Paul was eventually taken to a hospital where he survived. He was told later that the enemy soldier was 14 years old. Less than two months later, Paul was back at the 173rd airborne base camp in Vietnam. He remembers some officers playing volleyball when suddenly the enemy attacked and hit the camp with mortar fire. Paul was hit with shrapnel up and down his back and shoulder while trying to rescue the officers. That frightful day was Jan. 9, 1970, ironically, Janis’ birthday. It was also the last day on the ground as soldier for Paul. With his back and shoulder severely damaged, Paul was sent home, and he spent a great deal of time in Veterans Health Administration hospitals recovering. He was eventually honorably discharged from the Army after earning a Bronze Star, two Purple Hearts, and several other combat awards. After recovering from his injuries, Paul went to work for the Ford Motor Company in Green Island, NY just outside of Troy, from 1970-75. The plant scaled back its operations in 1975, and Ford offered to move some of the employees to Michigan. Paul didn’t want to move. His wife had a good job as Director of Admissions for Albany College of Pharmacy. A year later, Paul and a friend purchased a road house bar and named it Jake’s. “It was like the one in the movie [Road House, 1989, with Patrick Swayze], but not as crazy,” Paul says proudly. Paul says Jake’s was successful and fun to own. They brought in top bands from around the area and served some food (cold sandwiches) and plenty of beverages. Paul bought out his partner in 1978 and eventually sold the roadhouse in October, 1979. A couple of employees at Jake’s, a bartender and a doorman, worked days at the Port of Albany. Paul needed a job and says “you really had to know somebody” to get a job at the Port of Albany. Paul was hired by Federal Marine Terminals on the Hudson River and turned it into a fulfilling 25-year career. He started as a longshoreman loading ships, and advanced to a supervisory role. Janis eventually retired, too, and the two became snowbirds. The Fishers stayed one winter in a condo near where some friends had a place in Clearwater, Fla. They fell in love with the area, purchased “a place in a gated community” in 2008 and have been spending winters there ever since. They usually leave New York at the end of October or early November and return in the beginning of May. Was there ever a thought of making Florida their year-round home? In his retirement, Paul plays a lot of golf, both in New York and Florida, but his favorite hobby is his “show car.” Paul purchased a Teal Turquoise 1965 Pontiac GTO for $38,000 in 2011. He finished the engine himself, did a lot of the work on the car, and says it’s now worth $62-$70,000. Paul wanted his GTO in Florida for six months and needed a place to store his vehicle. The condo only had a carport so a unit at Life Storage was the answer. “Thanks to Life Storage, my car is secure and I have peace of mind that my baby is safe,” Paul says. Paul takes his GTO to car shows, usually eight in New York but up to 16 in Florida. He also loves going on “cruise nights,” evenings when a group of classic car owners drive down the coast and stop for dinner in places like St. Petersburg. “It’s a great time, a lot of fun,” says Paul. Paul says he has received some offers for his GTO and he would sell it, but he wants at least $65,000. “I have a lot of “sweat equity” in the car,” he says with a jovial snicker. Like most snowbirds, Paul and his wife Janis have found a perfect balance for the best of both worlds during their retirement. Jerry Houck is a kind, honest man who doesn’t pull a lot of punches. He tells it like it is. The 73-year-old Ohio native has seen most of the United States and admits he has a “good life.” Jerry and Sally, his wife of almost 50 years, are now enjoying the good life as retirees and have been snowbirds for 14 years. But getting to this stage in their life has been an adventure and took “a lot of hard work,” Jerry says. Jerry was the youngest of three children growing up in Homer, Ohio, located southwest of Cleveland, about a one- hour drive from Columbus. His strong work ethic was developed as a teenager raising sheep on the family farm. Jerry’s father was a railroader and wasn’t around a lot. “He gave us chores to do,” Jerry remembers. “He would say, ‘I don’t care when you do them as long as it gets done before I get back.’ ’’ Jerry says they “usually” got the chores done before their father returned. In seventh grade, Jerry told his father he wanted to buy and raise sheep. He needed $50 to buy five sheep. “My father could have given me the money, but instead he took me to the bank and made me take out a loan for $50,” Jerry says in his soothing tone. “He was teaching me a little lesson there… I wasn’t going to get a free ride,” Jerry adds with a soft laugh. Jerry enjoyed raising the sheep, but he eventually sold them before he graduated high school. High school was a pivotal stage in Jerry’s life. It’s where he found his first and second loves. He starred on the high school basketball team, starting every varsity game from his sophomore year on. Jerry, at 6-foot-3, was the tallest player on the team. Jerry fondly recalls playing a big game against a large school from Columbus which had two players who were 6-foot-7. “They couldn’t play a lick. We put a whooping on them so bad,” Jerry says. “I scored 25 points by halftime, but I got taken out in the third quarter because we were beating them so bad. I was upset … I wanted to score more.” Jerry’s single-game high was 34 points. Starting his senior year, his high school and another local school merged to form Northridge High School. Jerry remembers the school wanted students to meet each other so they set up committees that brought the kids together. That’s when he met the love of his life, Sally. 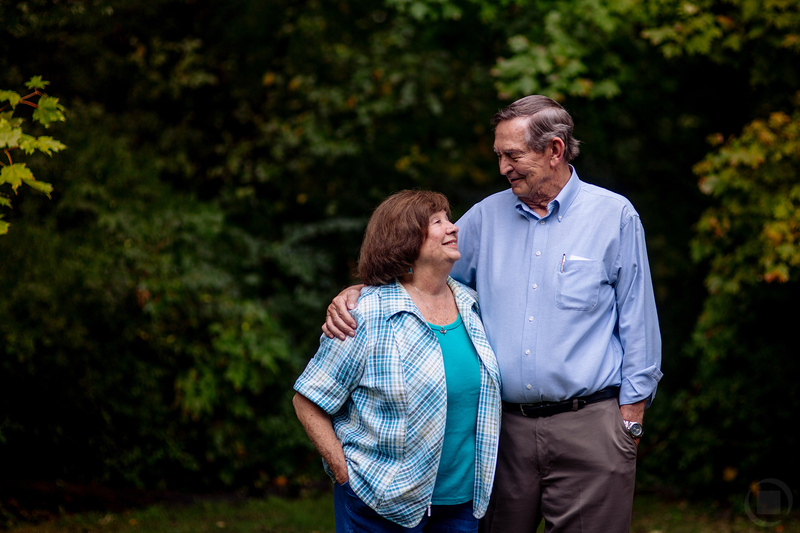 “We were put on the Civic Service committee and that’s how I met her,” says Jerry. Jerry considered playing basketball at Otterbein College, in Westerville, Ohio, but decided to attend Ohio University. Sally chose Ohio State University in Columbus for nursing. After graduating college, Sally worked as a nurse for a year and then became a flight attendant for Eastern Airlines. She was living in New York City, and Jerry was teaching geography, economics and history at a middle school in Cleveland. Jerry went to New York City and without much fanfare or anyone knowing, he married Sally in 1967. They had a “fake wedding” for their parents and some friends a few years later in Croton, Ohio, but didn’t tell their parents about the official wedding in New York City until 5 years later. “By then, it really didn’t matter,” he says with a spirited laugh. Jerry “enjoyed” a 30-year career for GTE Communications, which became Verizon after a merger in 1999. He lived in Dallas for many years and traveled throughout the country. He retired at age 56 but continued to work as a substitute teacher and also did finance work on the side, “investing money for some individuals,” Jerry says. Jerry is proud of his accomplishments and the fact he was financially capable of retiring at age 56. Along the way, Jerry battled lymphoma and an aneurysm. He says he’s been cancer-free for the past four-and-half years. To say Jerry and Sally enjoy their retired life would be putting it mildly. The Houcks rent a condo year-round in Vero Beach, Fla., but they only stay there about six months. They leave Ohio at the end of October and return the first week of May. Always waiting there in Florida, in storage, is Jerry’s fishing boat – a very important component of their snowbird experience. There are several freshwater lakes near the Houck’s condo, and fishing has become Jerry’s go-to hobby with a couple of friends and even his wife. Jerry has a 16-foot bass tracker aluminum boat that he purchased “showroom new” in 2012. He fishes once or twice a week. He enjoys his time with “buddies” Joe, 85, from Ohio, who now lives year-round in Florida, and Danny from Pennsylvania. They usually fish for largemouth bass, and Jerry’s best catch was an 8-pounder. Jerry says his Life Storage experience has been “terrific,” describing the facility as convenient, close and clean. “We are treated really well,” he says. When Bill and Adrienne Robinson of Frankfort, Ky., head south for the winter, they are interested in three things – rest, relaxation and sunshine. “You could say I’m pretty laid back,” says 68-year-old Bill. Reading a good book under the warmth of the sun is among the things the Robinsons enjoy during their winter stay in Gulf Shores, Ala., where they rent an ocean-front duplex usually from the first week of December to the middle of March. Bill and Adrienne also like to take long walks and love to cook. “We just like to take our time,” Bill proudly admits. Bill says a typical winter in Kentucky usually means about 30 inches of snow and an occasional day with temperatures as low as -10. In Alabama, it’s easily 20 degrees warmer on average, and plenty of sun. Bill was born in Lawrenceburg, Ky., and raised on a tobacco and dairy farm. He says he developed a strong work ethic from farming. “Milking cows twice a day, 365 days a year is a lot of work,” Bills says. Bill graduated from Anderson High School in 1966 and attended Eastern Kentucky University where he graduated in 1971. During that time, the Vietnam War was still going strong and Bill’s student deferment expired in 1970 making him eligible for the draft. He was fortunate enough to find an opening in a National Guard unit in Bardstown, Ky., only because that unit had been activated and sent to Vietnam and most members of the unit had enough service time to be discharged upon their return to the states. In May, 1970, Bill found himself at Fort Campbell, Ky., in basic training. That was followed by artillery training at Fort Sill, Okla. Overall, Bill spent nine years in the Kentucky National Guard. Adrienne graduated from Frankfort High School in 1972 and began employment with the Commonwealth of Kentucky. Bill, too, started working for the state around the same time. Bill and Adrienne were married in 1980. They headed south for their honeymoon toward Dauphin Island, Ala., but it had been rendered pretty much inaccessible as a result of Hurricane Frederic, which hit the area in September, 1979. They drove until they reached the end of the road in Gulf Shores and have been going back for the last 36 years. Bill retired from the Commonwealth of Kentucky Department for Public Health in 2000 after 28 years of service. Adrienne retired in 2002 from the Cabinet for Families and Children. One of the Robinsons’ favorite hobbies is following University of Kentucky basketball. Bill credits his upbringing, farm living and running for his good health.